The Mazda CX-5 has a new front-end design, along with sleeker sides and a lower roofline. Mazda hopes to boost demand for its CX-5, the brand's top-selling model in Europe, with a new generation that has better driving dynamics, improved fuel economy as well as a quieter and more comfortable interior. The CX-5 introduced Mazda's Kodo (Japanese for soul of motion) design language and SkyActiv technology when it launched the first-generation of the compact SUV in 2012. Mazda was praised for the original CX-5's responsive driving characteristics. To build on that the second-generation CX-5 gets Mazda's G-Vectoring Control, a software-based system that controls body roll for better handling, improved ride comfort and increased safety. The new CX-5 is 40 kg heavier than its predecessor because of improved noise insulation and additional technical features. Its body shell torsional rigidity is increased by 15 percent, reducing the response delay to steering inputs. Mazda says it has evolved the Kodo styling by giving the CX-5's front end a fresh look, with thinner, lower-placed LED headlamp clusters incorporating daytime running lights and a wing-shaped chrome feature that extends outward from beneath the grille to give it a wide appearance. The CX-5 is 10mm longer and 35mm lower than the current car with the same 2700mm wheelbase. Mazda aims to sell 400,000 CX-5 units a year globally, said Masaya Kodama, the SUV's project manager. The CX-5 accounts for about 25 percent of Mazda's worldwide volume. 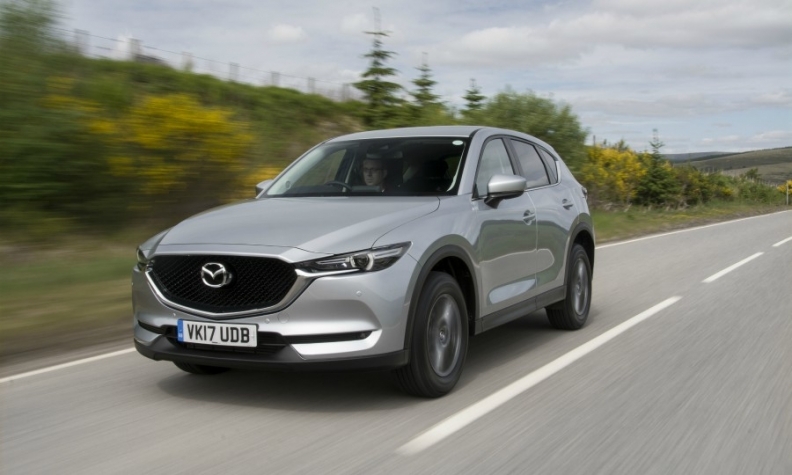 European sales of the CX-5 sales declined 1.8 percent to 23,623 in the first five months, according to JATO Dynamics, but despite the dip it remained Mazda's top model in the region. It ranked ahead of Mazda's CX-3 subcompact SUV, whose sales were down 3.8 percent to 21,834, and the Mazda3 compact hatchback, whose volume increased 2.9 percent to 19,924. Engines: The CX-5's 2.5-liter gasoline engine has cylinder deactivation technology, which improves fuel economy by up to 5 percent. A 2.0-liter gasoline engine and a 2.2-liter diesel will also be available. A hybrid drivetrain may come later. Technology: The CX-5 now offers automatic braking to avoid a frontal collision when driving at low speeds, along with traffic sign recognition and a head-up display. Infotainment: The new 7-inch display is the first in a Mazda to adopt optical bonding to join the LCD and touch panel, which suppresses reflections and presents a clearer image.